This week's installment continued the fight between Tiger and Barnaby, or rather a one-sided affair as Tiger didn't really fight back. Overall, I liked this episode, but I felt like something was missing, yet I can't quite put my finger on what exactly is missing. Well, that wasn't anti-climatic. Bunny-chan!? After all they've been through, "Bunny-chan" is what does it for him? Barnaby either really, really hates that nickname, or he really just likes it in secret. Either way, I guess I'm fine with this because it brings us back all the way to the beginning when they first teamed up. 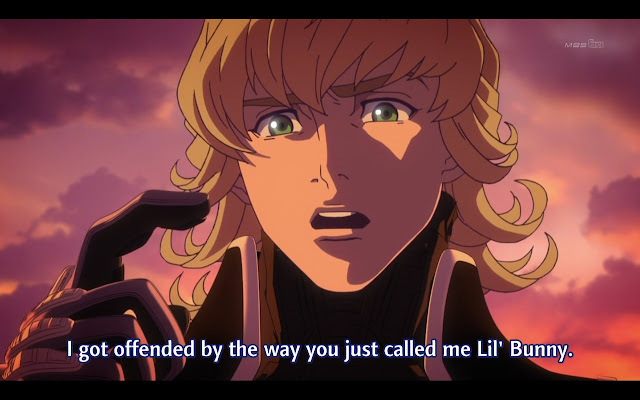 My only gripe was that Barnaby's rage screams sound really over-the-top. I know he's supposed to be extremely emotional, but that really hurts ears. Saito-san is awesome. For the coming episodes, I feel that Saito and Ben both will play a role in the conclusion of the series. 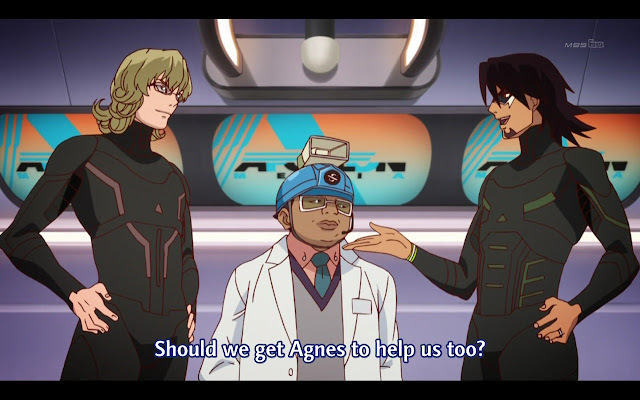 I wasn't at all surprised that Agnes' memories weren't returned because I think that we've all had the vibe throughout the season that she's partial to Apollon Media. What role will Hero TV play in this conclusion? Perhaps they'll broadcast Maverick's downfall and clear Kotetu's name when Agnes finally comes to her senses. This should have been expected. The impostor Tiger never spoke, and even defeated the other Heroes with ease. The latter had an obvious connection to episode 15, in which Cis was pretty much manhandling Kotetsu and Barnaby at the same time. Now that this super battle android has reached this level, how will our Heroes defeat it? I'd like to point out that Maverick is a true opportunist, bringing in Rotwang to try to satiate his innate fetish for TV ratings. The Dark Knight, anyone? I instantly thought of the Joker and the two boats when I was watching this scene. This episode not only tested the bonds between our two main heroes, but the other heroes' hearts as well. It's pretty obvious that none of the heroes will flip the switch, because of friendship, trust, because they're heroes and all that jazz, but the real question is how do they get out? 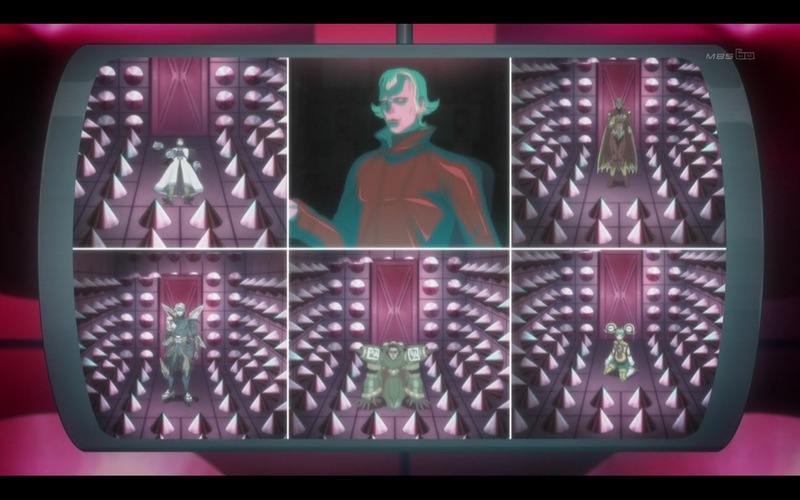 Maybe this is where Saito or Ben comes in and takes out Rotwang, and thus freeing the other heroes. I liked that Kotetsu and Barnaby's roles sort of reversed when it came to the safety of Kaede. 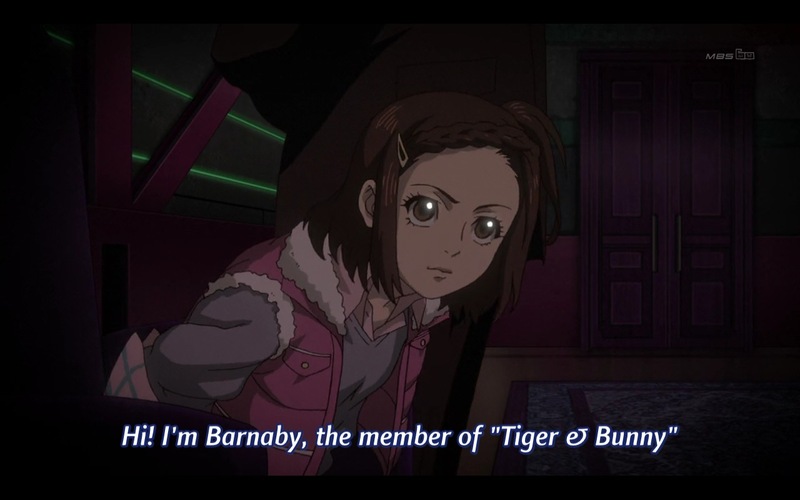 We've seen that Barnaby is usually impulsive and emotional, but Kotetsu can be as well when the situation calls for it. Only two more episodes left! 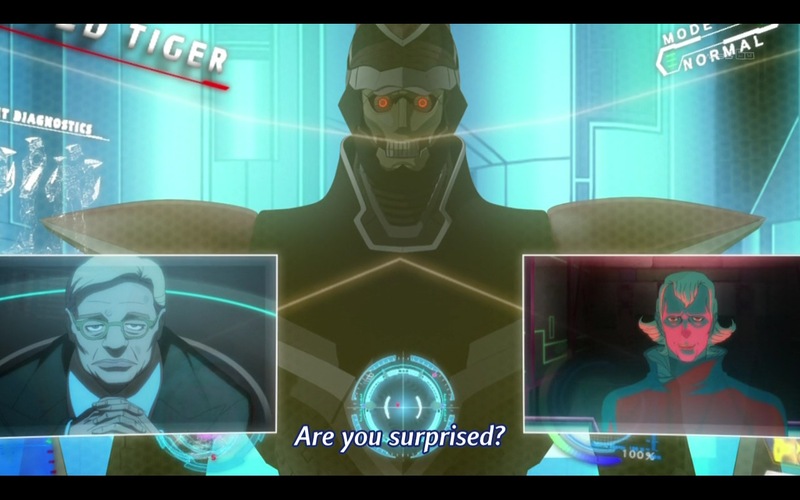 I wonder how they're going to have Kotetsu and Barnaby beat that super android.